University spokesperson Matt Lazier said the university is required to uphold free speech and could not infringe on the Cal Poly College Republicans’ right to protest. Lazier added that wearing holsters on campus is not illegal. “Wearing an empty holster on campus is not illegal, but UPD counseled the club members that they should not put other objects in the holsters and that the holsters should be clearly visible — so that they would not be mistaken for actual firearms,” Lazier said. A new Cal Poly libertarian club called Turning Point USA also gathered with the Republican club to educate students about guns. Members of both clubs sported empty gun holsters on their waistbands and patriotic apparel. According to Turning Point USA president Isaac Schick, the club values free markets, free people and free speech. “We like to defend people’s first rights — their rights set up by the Constitution,” Schick said. While Turning Point USA is unaffiliated with the Democratic and Republican clubs on campus, it holds libertarian values and and supports educating the public about gun safety and gun laws. “What [Democrats] don’t understand is that semi-automatic weapons include everything that’s not an old fashioned hunting rifle or a revolver,” Schick said. Materials engineering sophomore Matt Krock also turned out to educate people and support the group. Krock said he wants to see privatized background checks for gun buyers, but not a ban on all semi-automatic weapons. “There is a place for making sure people buying guns aren’t going to go around killing people with them. That said, I don’t think that the way to go about it is banning all guns, because once you ban all guns, then people who illegally have guns are going to start killing people and they won’t have guns,” Krock said. Participants with gun holsters were instructed not to obscure their holsters or put any items inside. “It turns out, to my own disappointment, that we are not allowed to put a banana in our holsters or anything else,” an intra-club email from the Cal Poly College Republicans said. University Police checked and took photos of empty holsters for security reasons, the club members said. Turning Point USA had hoped to educate and talk with members of groups with opposing views on guns, but efforts were unsuccessful, Schick said. The event received negative feedback on Facebook, as a post by SLO Solidarity spokesperson Gina Welisch received 160 shares. “Shoutout to the Cal Poly Republicans for disrespecting and making fun of the lives lost in the Parkland shooting. #neveragain,” Welisch’s post read. 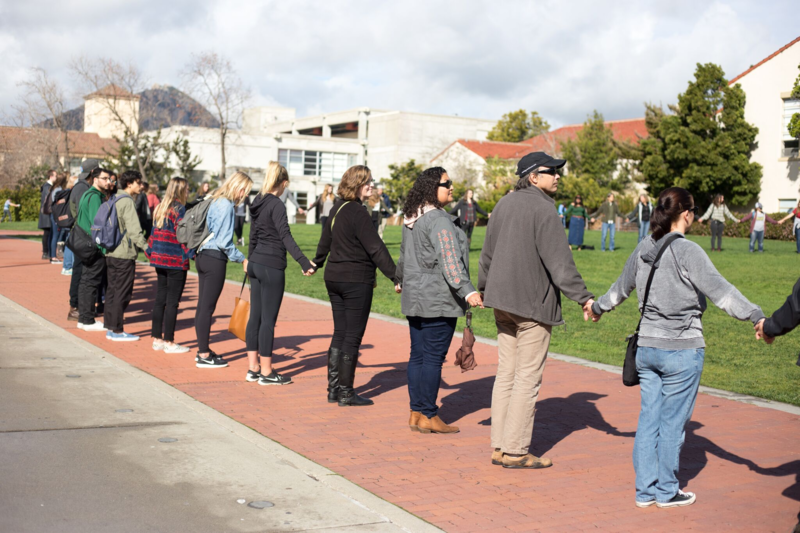 At the same time as the empty gun holster event, Cal Poly students and faculty stood in silence for 17 minutes on Dexter Lawn, paying tribute to the 17 lives lost in the Parkland, FL shooting Feb. 14. Art and design Professor Charmaine Martinez participated in the walkout, also held to demand gun control. “I am not optimistic that any gun control measures are going to be passed by our current Congress, but I think it’s important to show opposition and concern about violence and guns in school,” Martinez said. Martinez as a mother of elementary and middle school students and a professor of students at Cal Poly, she is concerned about the safety of schools. “The government has the power to make them safer,” Martinez said. Cal Poly Police and university spokesperson Matt Lazier could not be reached for comment. Update: This article has been updated to include comments from Matt Lazier and Charmaine Martinez.